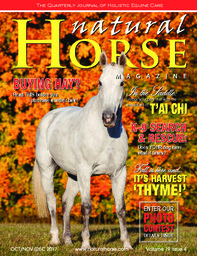 The Natural Horse--October 2017--Life as a horse person is physical. Success and satisfaction as a competitor, trainer, breeder, farrier, groom, working student, veterinarian, chiropractor, massage therapist or amateur hobby rider requires use—sometimes strenuous use—of an able body and mind. If an equestrian or equine professional becomes injured or ill and can’t pay their bills, the world can come crashing down. While struggling to recover, they risk losing their job, financial security, independence and quality of life. Even with insurance, bills can accumulate. Families and futures are impacted.